Home / Entertainment / News / Video / An intense fight between a wildcat and a puff adder snake! Who do you think won? An intense fight between a wildcat and a puff adder snake! Who do you think won? What will you do if you saw a deadly wild beast and a poisonous snake fighting in the middle of the road? Will you disembark on your vehicle to see the fight on a closer view? An African wildcat is a wildcat which can be found in Africa and in some Arabian countries. They are also called Near Eastern wildcat. They have been living in the surface of the Earth 131,000 years ago. In the Middle East, about 10,000 years ago, they try to domesticated these felines. They are mostly found in burial site in Cyprus. Sometimes they try to create a hybrid version of an African wildcats by breeding it with a domestic cats. This practice is still common today. The wildcat can grow up to 18.5 to 23.5 inches long combine it with a 10.5 to 14.5 tail. They have a light sandy grey fur which can varies from pale yellow to reddish hue. The color of the ear is from reddish to grey, with long yellowish hair. They are very active at night, just like any other cats, searching for their next kill. They have a very perfect hearing that they can pinpoint their next victim. They rarely drink water and hunt for mice, rats and other small mammals. When they are challenge, they raises their hair. This is to make themselves larger and to intimidate their adversary. During daytime, they hide in bushes however they are active on a cloudy day. A female wildcat can give birth up to six kittens. When giving birth they try to dig a hole on the ground and rest. This usually last up to 56 to 69 days. Like other kittens, they are blind at birth and their mother keeps care of them. Most of the kittens are born during the wet season because this season has the most sufficient supply of food. The kittens stay with their mother up to 5 to 6 months. 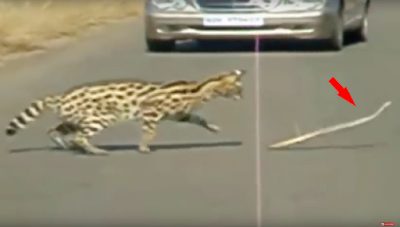 In the video, motorists try to stop because of a fight between an African wildcat and a puff adder snake. As mentioned on the previous article, this adder is deadly and poisonous. The cat tries to kill this deadly serpent by hitting it with it razor sharp claws. The cat follows the snake until the other side of the road. As these wild beast cross the road, one of the motorists tries to move their car backward to avoid this wild fight.